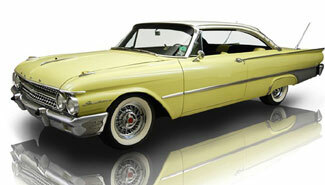 The exterior of this 1961 Ford Starliner is in superb shape with all original trim and stainless. The body paint is code FM, meaning Corinthian White over Desert Gold, which is an odd way to describe a car that, to the untrained eye, is a lovely cream over light yellow. The color scheme's a classic and it looks great with the styling touches and bright work. Bumpers and other chrome shine as new, the intricate grille and tail panels are gorgeous, the acrylic hood and fender ornaments are excellent and the stainless trim is highly polished. The coolest piece of trim work is far and away the side spear that extends from the tip of the fin on the quarter panel and ending gracefully in the door handle. Such touches would vanish in just the next couple of years with the manufacturer agreement to limit trim. Underneath of this 61 Ford Starline are the original floorboards, original brake and fuel systems, original shocks and even the original mufflers. Regardless of miles how many 47 year old cars have any of that, let alone all of it? Even during normal use mufflers rot out and parts fail�only a low mileage car will be spared the parts destruction. The rolling stock isn't original, as the car came with the standard steel wheels and deluxe hubcaps, but the dealer-optional Kelsey Hayes wire wheels and 215/78/15 BFGoodrich wide whites look so much better. Issue free, highly original�these are the terms we use to describe 90's cars, not survivor cars from 1961! The interior of this 1961 Ford Starliner is excellent and original. The original code 38 yellow and black seats are excellent for any age. The carpet shows no wear; the headliner is bright white. The dash pad is soft and un-cracked; the gauges are clear and cool in their silver tone. Every switch, every knob works as it should and looks like new. Chrome and stainless trim is excellent.